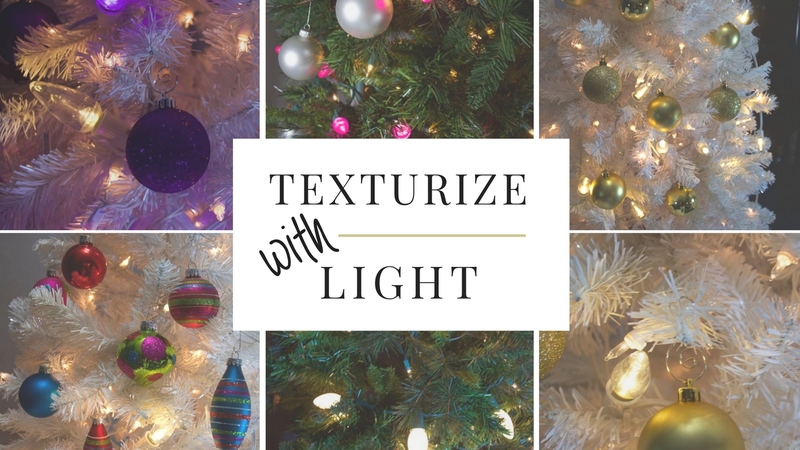 Here in the Christmas Light Source (CLS) design lab, we LOVE the current rustic chic design craze combining natural cotton, burlap, and magnolias. 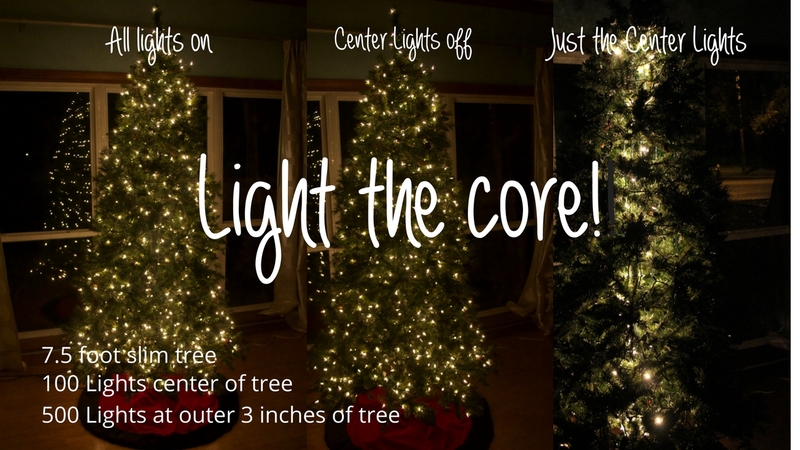 As I’ve been adding to our Pinterest board on the subject, one thing really stood out to me: How much all these projects really need a string of lights!! 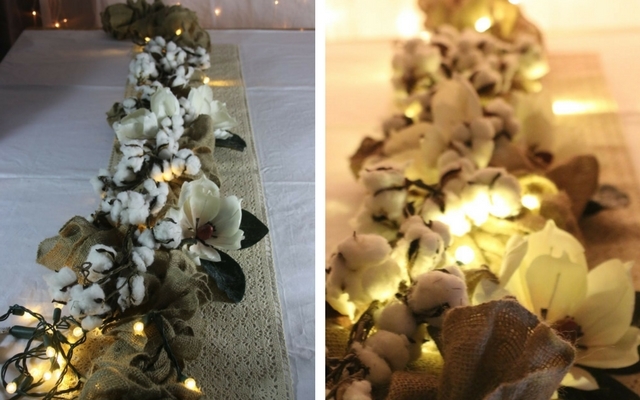 This project works great as a table centerpiece runner and all the principles translate really well to wreaths and more compact centerpieces. 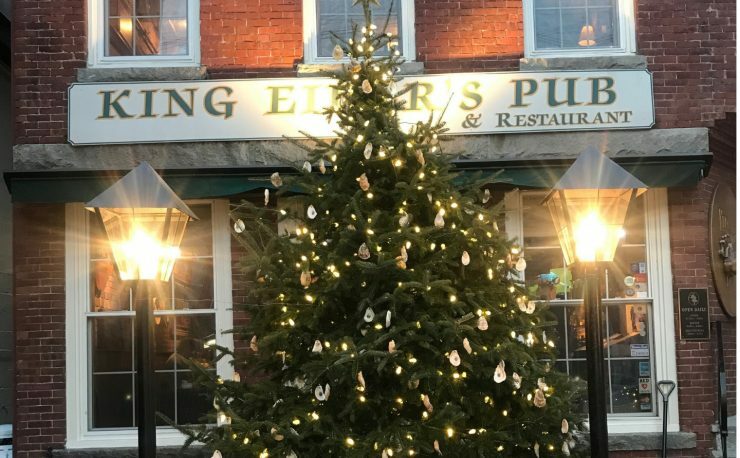 For wreaths, if you don’t have an outlet handy consider using LED battery lights as an alternative to a traditional string light. The lights. We pulled warm white round (G12) strings on green wire. 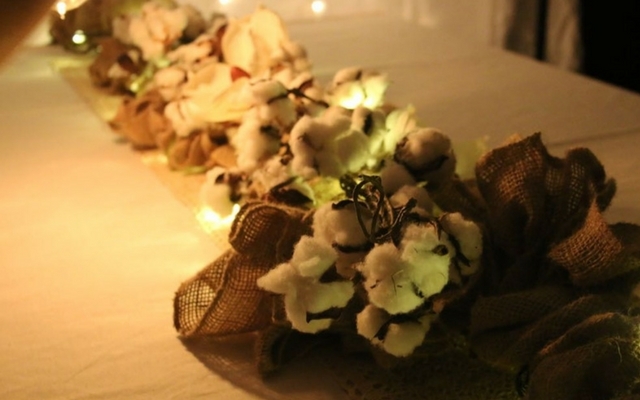 The wire color blended nicely around the stems of the cotton and magnolia stems. The warm white light strings come in several different shapes but since this project is at eye level, we chose the more ornamental round versus the small cylindrical 5mm shape. The magnolias. 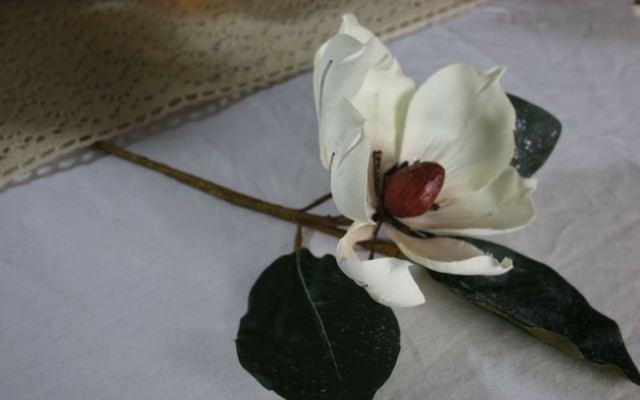 While the look of real magnolia flowers and leaves would be fantastic, these artificial flowers look great for those of us who don’t have access to the real thing. Find them online or at your local craft or hobby store. The cotton. 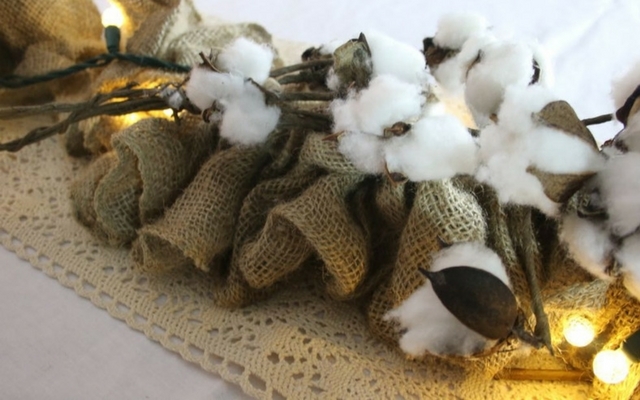 Though in super-short supply at this moment, to find cotton for this project keep an eye out for the delivery truck at Hobby Lobby (with your 40% coupon in hand) or check them out at Magnolia. 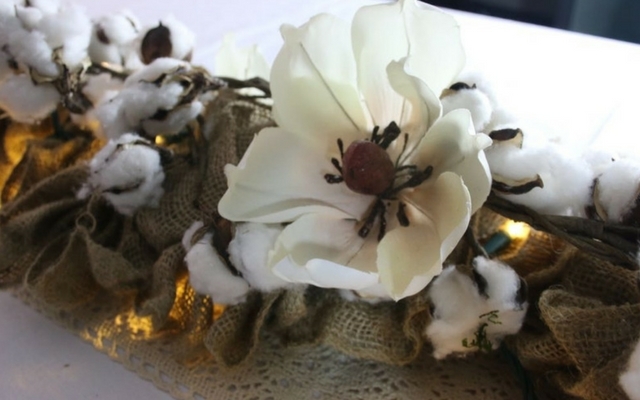 For this project, combining them with both burlap and magnolia blossoms and leaves means your cotton branches will go further than using them alone. 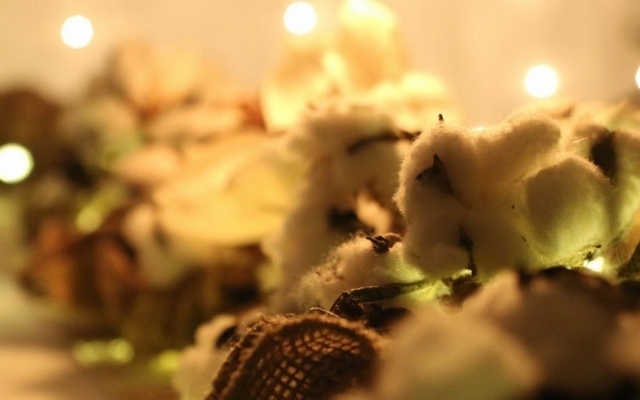 My family out in West Texas has been in the cotton farming business for over 30 years so I went to the source to get the skinny on cotton and this apparent shortage of decorative cotton. I called my cousin, Karen. Me: Hey, Karen, it’s me, Shellie. Karen: Yep, that’s what my phone says, what’s up? Me: LOL, well… sometimes it’s says “unknown” and I didn’t want to assume… hey I’m calling about this cotton, burlap and magnolia decor trend we’re seeing right now. When is cotton going to be ready to harvest? Because I just might come visit and fill my trunk with cotton. Karen: Well, they’ll be ready around October or so. Right now the cotton plants are only 6 inches tall. Me: Well, my friend, Elizabeth says that she can get it off the side of the road in Alabama. What gives? 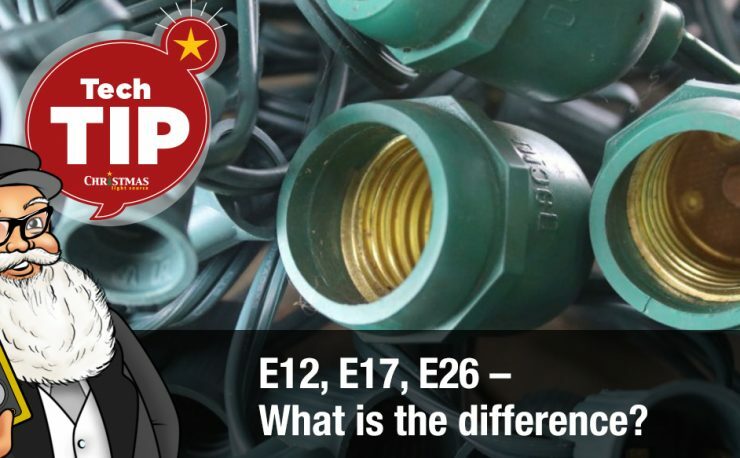 Karen: Well down in South Texas, East Texas and places like Alabama, it gets warmer faster and they are able to plant sooner and their cotton is showing up about now and will continue through the summer based on when they planted it. 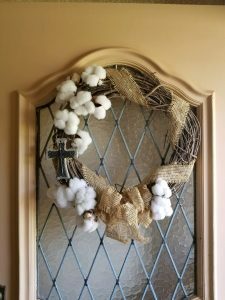 Karen: I pulled in a bunch of cotton last October from John’s field (that’s her husband) and made a wreath. It’s on my door. I used a grapevine wreath base. 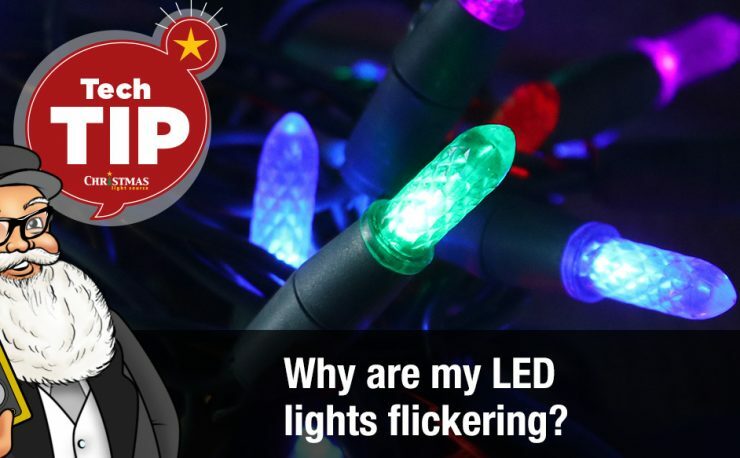 Me: Does it have lights? 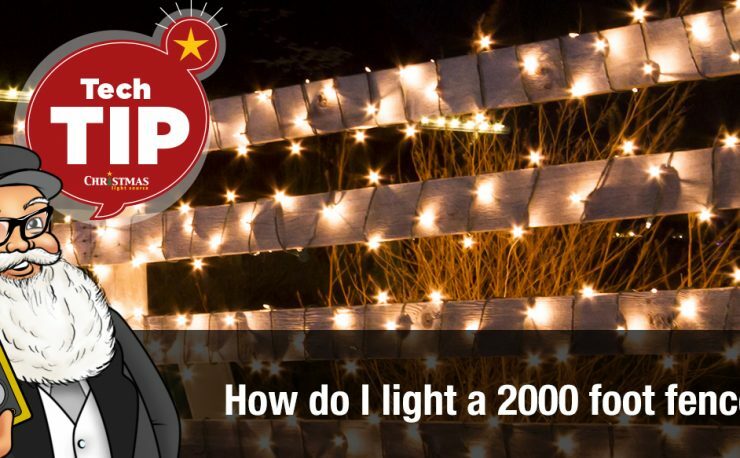 Shellie: I’ll send you some lights. If you use cotton straight from the field or the side of the road, it won’t be perfect, it’ll be a little dusty and might be full of leaves and stuff. 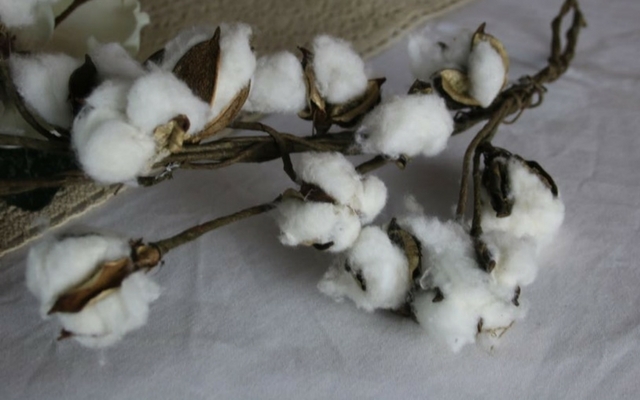 Karen harvested cotton bolls in different stages of bloom and even though a couple of them opened more than she would have liked, the multi-stage blooming was an effect that she enjoyed. Here’s our cotton. Purchased on a very lucky day, indeed. The burlap. After you track down the cotton, choose your favorite form of burlap. 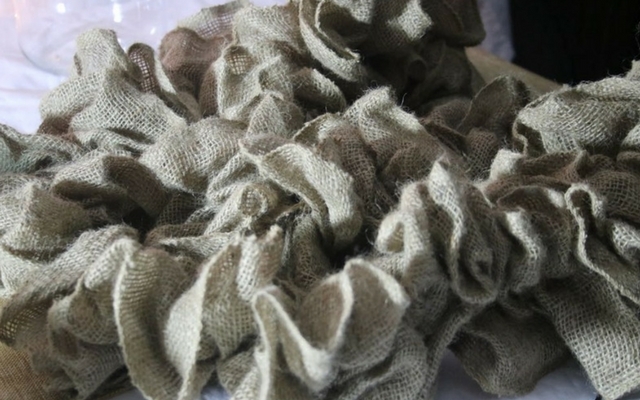 We’ve used a burlap garland that is the star of many of our projects. The design elements of this project would work for wreaths, working as centerpieces and as stand alone displays where the stems are grouped in vases. 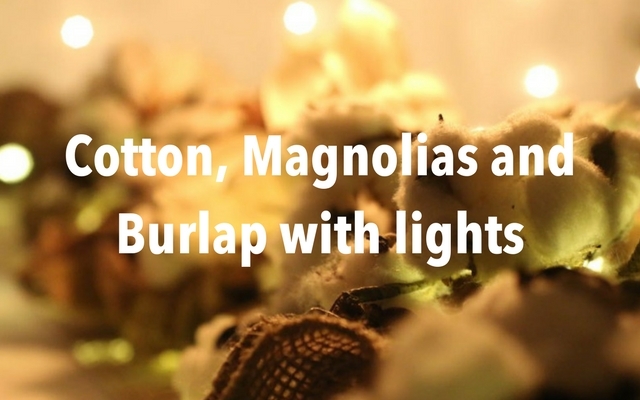 Artfully install the cotton and magnolia picks into your burlap. In our experience, you shouldn’t need hot glue to secure everything together. 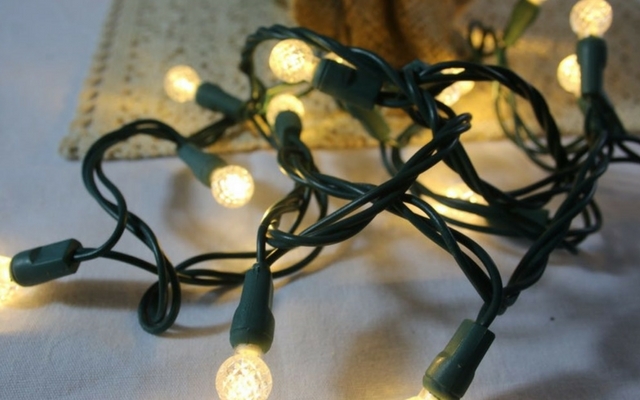 Plug in the LED light strings, turn out the room lights and be amazed. 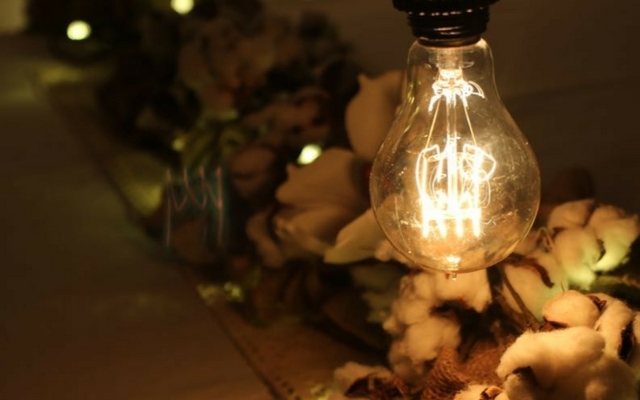 Add an Edison bulb light to finish out your rustic chic decor! Please send photos of your project to customerservice@christmas-light-source.com We’d love to see them! !